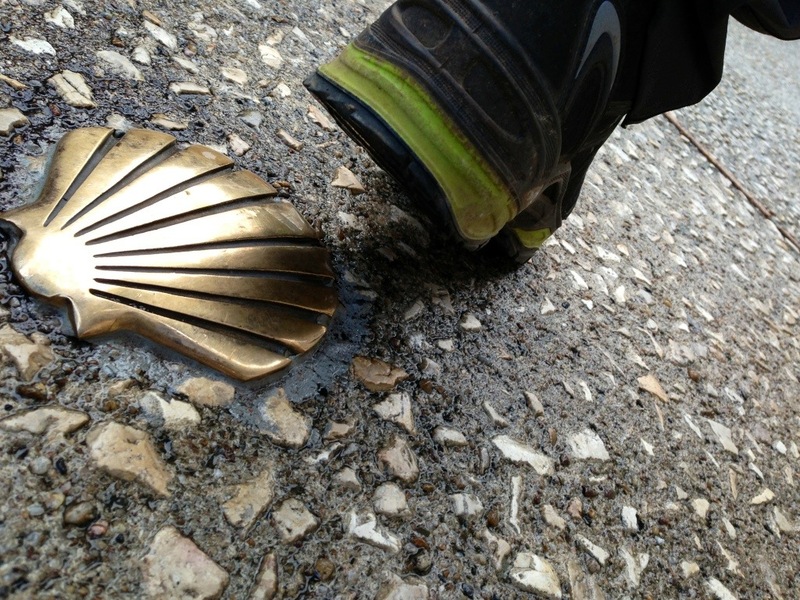 I strolled down the last street of Cahors following the occasional, teasing glint of brass scallop shells embedded in the streets. The Pont Valantre rose up from her roots in the River Lot, standing firm as she has done for 700 years, a sentinel over the waters. Cobbles pushed up through my soles, the locals meandered towards home after another days work. I reached the other side and climbed slippery rock, picking out cracks and dents to gain purchase. I looked back from my perch over the city and smiled to offer thanks for good memories, one last lingering look over the roof tops, as now I was level with the Ponts towers. It was the second passing through Cahors and again she had treated me well. I watched the river glide past at a speed no quicker than a lone pilgrim, albeit far more gracefull. I continued along tracks carved into the forest, the white limestone rocks peeking through the surface against a dark ochre soil merging into evergreen pines. Tracks sprayed off all around me, off to follow other routes to different destinations and I wondered where they went. I day dreamed but had to remember to glance up once in a while to find a friendly Balise, gently motioning to Santiago, still 6 weeks distant. Dark, malicious skies battled with shafts of white sunlight, eventually finding a way through the angry skies. 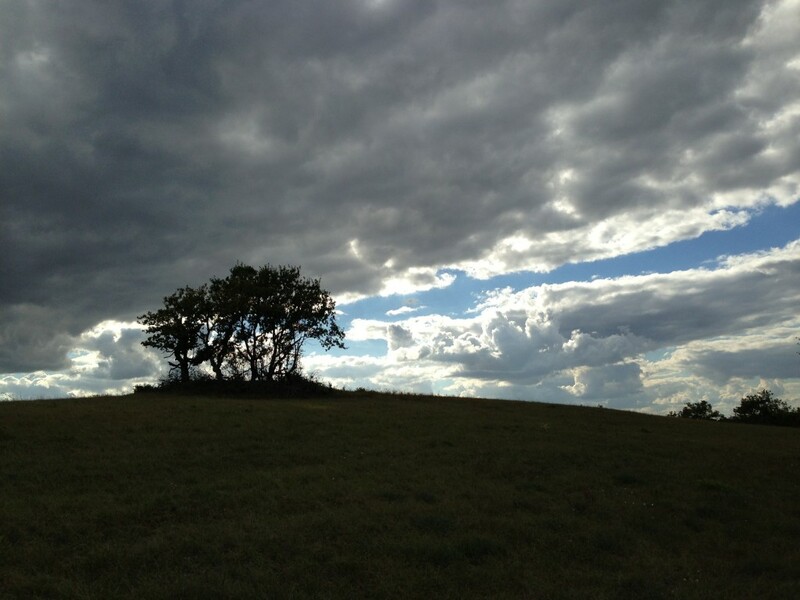 Solitary trees stood firmly on hill crests, silhouetted against the evening light and crickets started their chorus. The first fungi were poking through the pine needles as trees blended to grass land. Summer greens are fading to browns now as the first signs of Autumn appear. The occasional, hopefully premature leaf sinks towards the Camino. 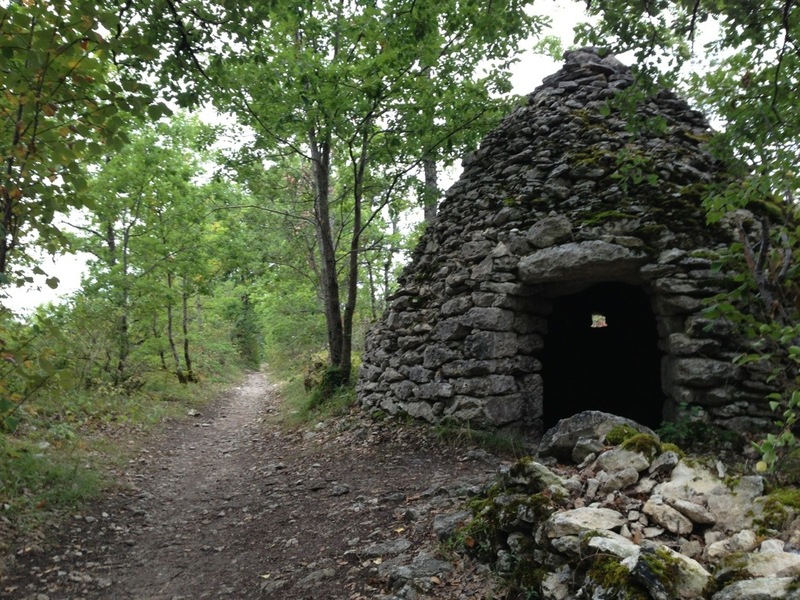 I carried on towards the Gite at Lascabanes, recommended by many as a friendly and tranquil resting place for the night. Although full, they had granted me a spot in the garden to pitch my shelter and a promise of an evening meal. I saw no one, a rarity at present but guessed they had already passed through, no one would have left the city in the afternoon. I found Aline writing her journal and resting sore feet from a 27 mile trek the previous day. I sat beside her on a lone bench in the quiet hamlet of Labastide Marnhac whilst we shared some fruit, warm from the days walk. Children screamed and played in a nearby playground and the occasional Madame strolled past slighting a weak ‘Bonjour’. Bruised feet reach the Gite and my hostess pauses preparation for the evening meal to show me around. She tells me there is in fact a last, spare bed. I decline politely, just wishing to camp. Do I want a meal she asks and remembering some long forgotten food in the depths of my pack I decline again. ‘No’, I reply as she guides me to the garden. She speaks good English so I continue. ‘The price is fine, I have a little food I need to eat but thank you’. I relent, finally and thank her, the lure of a home cooked meal always sways me. I hang out some damp clothes, still wet from the previous days rain and pitch my tent amongst Quince, pear and apple trees just starting to drop their fruit. The church bells ceased rolling at 10.00 and thankfully stayed quiet all night. I was sad to leave Le Nid des Anges Gite in the morning. Tolling woke me at 7.00, I packed away a damp tent from a low mist that had descended on the valley overnight like a river flowing through lowlands and set off quickly, munching on some stale bread and a banana well past it’s prime. I quickly passed some early Pilgrims taking photos and stretched my legs out for the days walk. A cockerel called from the hill ahead, answered by farm dogs. 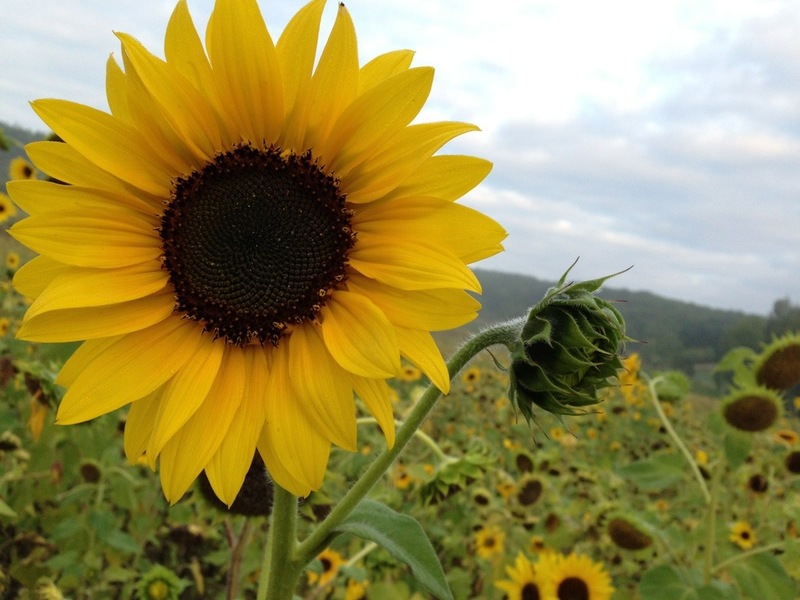 Fields of sunflowers bowed their heads sadly as their stalks turned brown, their life coming to a summers end. I slowed to watch 2 dogs and their owners. My French was too limited to pose questions as to what they might be searching for but as the dogs darted about, noses glued and hoovering along a musty soil I thought it may be the start of the truffle season. Abruptly one stopped, paw lifted off the ground and bent back, howling a call to its master as maybe the treasure had been located. I smiled as I approached Bonal. A memory from my last time here. The same farmyard with scattered farm machinery and that smell of oil, engines and metal. A mechanic peered out from under a tractor, grease on his face, black hands and dirty overalls, muttering a Bonjour. I stop abruptly merely 50 feet further as a kind farmer has left a flask of strong coffee on a rickety old table. Tomatoes from his garden piled high in a basket. I sit, eat and drink and feel a little energy reach already tired legs. I have cooled after the short rest so walk off pulling down my sleeves and tightening the zip to my neck. Downhill and I look up to see the village of Montlauzen, the church spire and a few lower roof tops breaking through the trees atop its hill a mile distant. It signals my direction, often all that is needed here is a glance westward to the next church and this is the direction I must travel. Finally a vague sun breaks through low cloud and attempts to warm the land and argue with a lingering dew, my surroundings start to warm. Limestone outcrops streak across a distant hill, a panorama begins to unfold in the shallow valley below me. Furrowed fields play with lines of perspective and fields of sunflowers interrupt woods, yellow rectangles lost in brown and green. Another familiar hilltop village appears as I crest a brow. 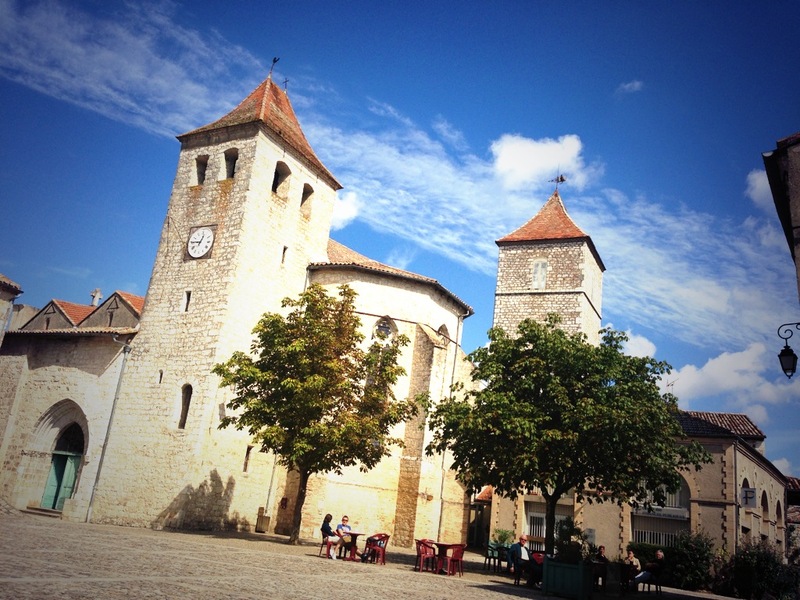 Lauzerte stands impressive, it’s old stone buildings forming a ring around the upper elevations. I climb steeply past others straining to the summit, switchback a couple of times and then enter the centre. A couple of cafes cater to a few tourists and pilgrims slouch in chairs drinking coffee, nursing their feet. 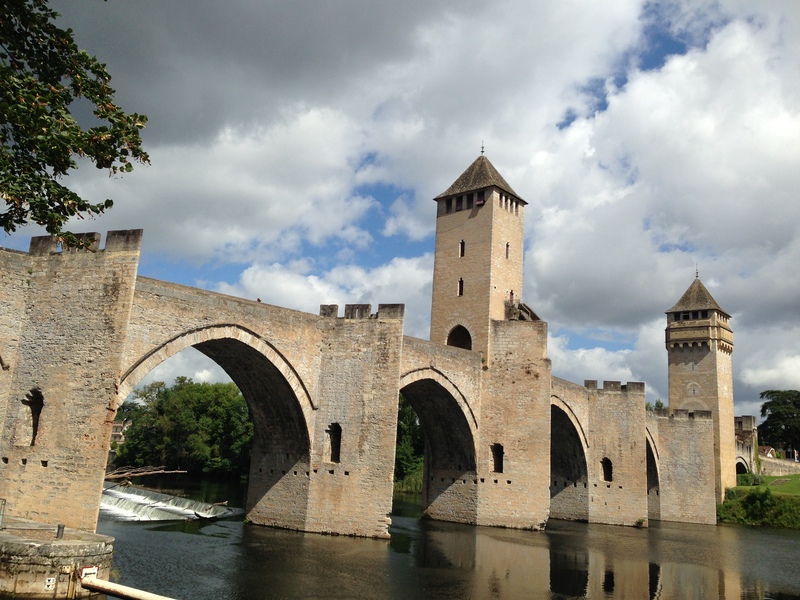 Espalion, Cahors and Moissac, to name a few, are places that I have fond memories of. It’s usually the places that I spent time in on my last trip that have stayed with me. However, there have been some surprises as well. Auvillar is one such location that somehow I missed. Like Conques, it seems as though this place has remained untouched for a few hundred years. Recent restoration work is apparent but it’s beautifully in keeping with existing buildings. Walls constructed from a mix of stone, terracotta and wood, all apparently thrown together in no order but the result is a rustic mix that looks wonderful. Rather than feeling frustrated at my forgetfulness of such places, it’s more a pleasure of seeing new places that have somehow left my sub conscience. As well as the familiar, I now have the forgotten, or missed opportunities to make new memories. Some have questioned my decision to experience this path again, surprised as I have already walked it. I questioned myself but feel the decision has now been validated. If you partake of a fine wine, would you not, at some point, sample it again? I was the last to leave the Gite, one such example of a selection of old buildings given a tasteful, new lease of life. Over night rain has stopped leaving the town glistening in a weak, early morning sun. The last of the water channelled down through drainage channels in the middle of the street and around varnished cobbles. Dark clouds stayed stationary, apparently there for the day as no wind blew or threatened. I stopped at the small store and purchased a few small provisions for lunch, wedged them into my pack and made inroads into the steep climb out of town, again now a memory, albeit a restored one. I walked through a sleepy Bardiguess, advertising the village fete that coming weekend but with no reason to stop. A cafe beckoned down a side street but I was barely warmed up so carried on. A few pilgrims dotted the road that had left before me, some 2 miles ahead. A blister called a reminder of its presence but gradually faded. As Auvillars smile faded so St. Antoines helped brighten everything again. As I passed under an arch and on cue the church bells chimed 10.00 as a startled flock of pigeons rose dramatically from the bell tower. Lilac coloured shutters contrasted against baskets brimming with red, blue and white blooms. I entered the bar, a few locals sat sipping coffee and chatting, a business man looking out of place in such a quiet hamlet looked up from his laptop, nodded at me and said good morning. As the bar lady acknowledged my request, the coffee machine hissed, spat and a dark brown treacle bubbled from its chrome spout. This is not an arduous hike over desert and mountains, with little water and long distances between re-supply. El Camino is kind, it helps you out, assists you regularly with drink and sustenance, provides a warm bed in the rare instances when camping doesn’t appeal so much. It crosses your path with a host of interesting characters, enriches the mind with wonderful history and tales from the past written into the walls of eclectic architecture. It makes your direction, for want of a better word, easy. The legs will always move on automatic leaving the head to wander freely, to mull over the past, revel in the present and ponder the future.